The term “Panagia” is Greek for “All-Pure” which is used to describe the Virgin Mary who chose to be pure from sins throughout her life, and was also pure and ever virgin before, during, and after her giving birth to the Lord Jesus Christ. This perpetual virginity is symbolically represented in this icon and many others of the Virgin by the three stars on her clothing (two of which are visible in this particular icon) which are placed one on her veil on her head and one on each of her shoulders. 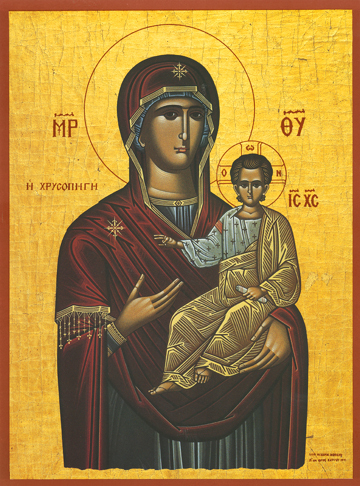 This is a contemporary Greek icon of the “Birth-Giver of God” (Theotokos in Greek) painted by Monk Michael of Mount Athos in 1991. In the Cyclades region of Greece on the Island of Sifnos there is a celebrated monastery of the Island’s patron saint “Panagia Hrissopigi” which is Greek for “All-Pure [Virgin] of the Golden Spring” on the southeastern end of the island built in about 1650. This often refers to the icon of the “Life-Giving Spring” (in Greek “Zoodohos Pigi”) although the icon here is depicted in a different manner. As a golden container is set to contain precious things, so the Virgin Mary contained the most precious Lord Jesus Christ.